Say hello to your favorite cream pie in cookie form! 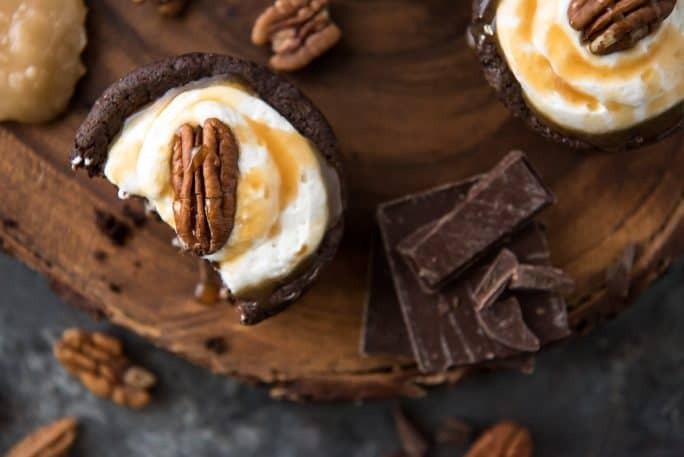 These Gooey Triple-Layer Chocolate Turtle Pie Cookie Cups have a chewy chocolate cookie base, are filled with caramel and ganache, then topped with whipped cream and crunchy toasted pecans. 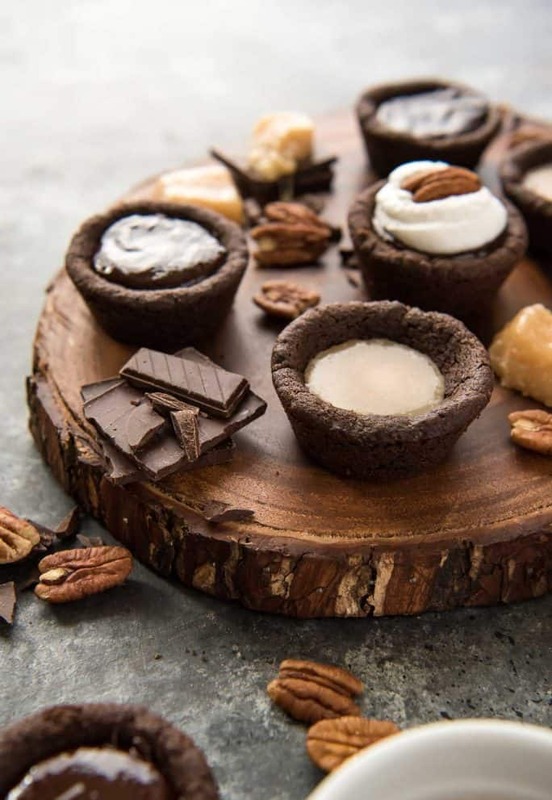 Say hello to my little friends, the Chocolate Turtle Pie Cookie Cups. They may just be small fish in a HUGE pond of cookie varieties, but they’re definitely a prize worth catching. If you know what I mean. I suddenly don’t know how I feel about using a seafood idiom to describe how good cookies are, but we’ll go with it. Well. 11 months down and 1 to go. How are feeling about December? Are you as mind-blown as me that we’re a mere 4 weeks away from another brand new year? Home. Travel. Love. Family. Did you accomplish all your 2017 goals? I’d say I probably crushed a few, but there is still a handful that will be worked into my 2018 strategy. More than I’d like, if I’m being totally honest. But then, they’re mostly goals I didn’t even know I had until almost halfway through the year. This time last year (literally this week,) Abe and I were house-hunting in North Carolina, dreaming big dreams of promotions and new scenery by 2018. Snow in the winter. Weekends in the mountains. A new home to make our own, in a new town that already came with local friends and fabulous food. My career change back in the spring blindsided everyone, I think. Including myself. I truly thought it was a smart move, and that I would grab it by the horns and rock it the way I know how. Isn’t that how dreams always start? So full of promise and ambition. Lots of hope. I thought I had it all figured out. I was looking forward to getting away from a work situation that made me entirely unhappy every single day. Little did I know that I was stepping into a similar one, wholly unprepared for what was expected of me. I made mistakes that did not go unnoticed or unpunished. The learning curve was steep and unforgiving. I don’t crack under pressure easily, but I was teetering dangerously on the edge. I woke up one morning, dreading my workload that day, when it hit me – why did I leave one miserable 55-hour work week for an equally miserable one? Working from home was nice, but I was just as stressed at the end of the day in my PJs as I had been in my button-up shirts. A few months in, I just quit. No backup plan. A few potential incomes loomed on the horizon aside from the blog, but nothing steady like what I’d known for 17 years. For the second time in a year, I embraced the Millennial that I refused for so long to identify with. I decided my happiness was worth more than a paycheck earned with tears and anger. I sure do hate the YOLO phrase, but I’m pretty much living it right now. Pass me another one of those Chocolate Turtle Pie Cookie Cups. 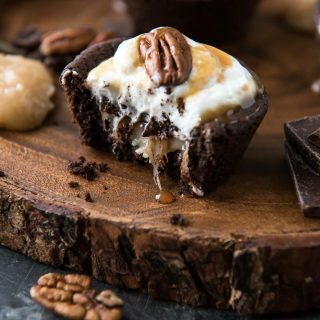 These Gooey Triple-Layer Chocolate Turtle Pie Cookie Cups make me so happy! Much like this awesome job I now have (blogging! ), I love love love these darling little cups. 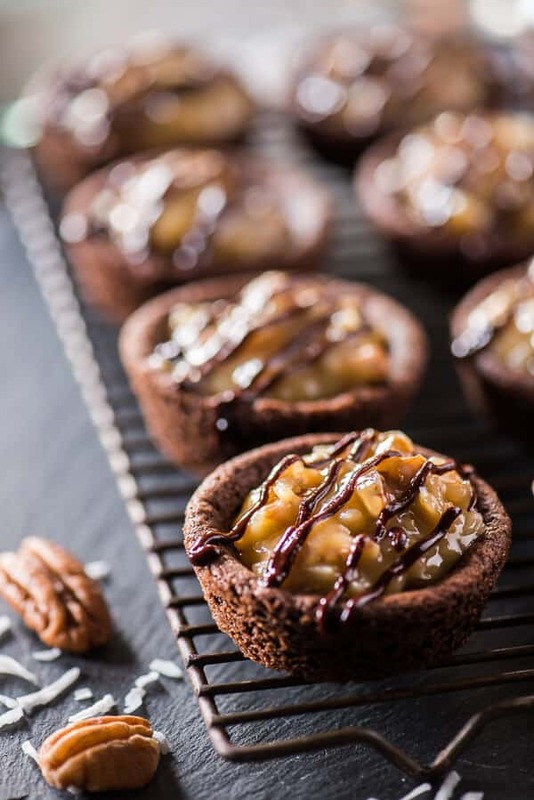 I adapted my German Chocolate Cookie Cups to create these tasty individual-ish turtle pies. They are seriously so easy, in spite of the rather daunting-looking ingredient list. Don’t want to make caramel? Just pop a store-bought caramel square in the dough before baking it. Boom. Done. 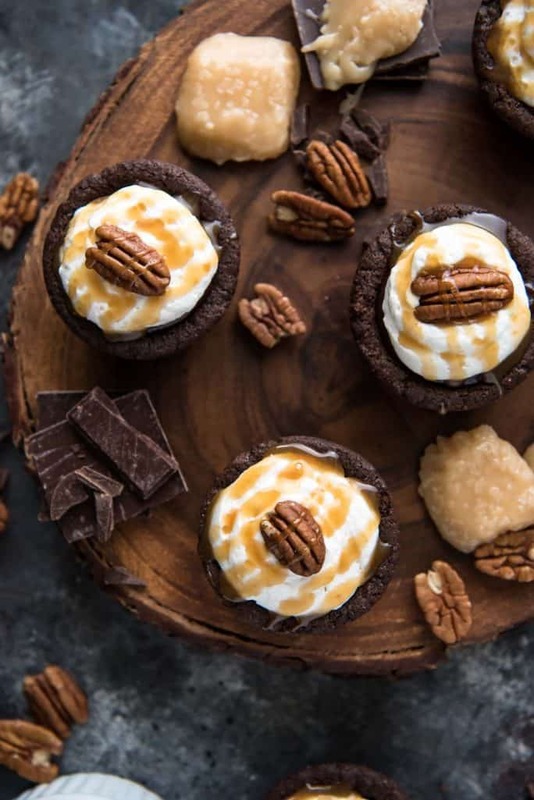 Making these Chocolate Turtle Pie Cookie Cups in advance for holiday parties? 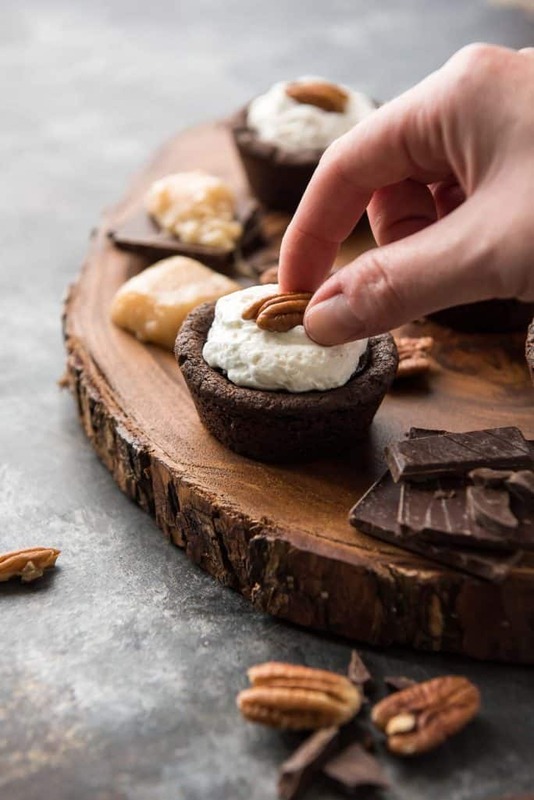 Wrap them up tight and fridge or freeze them, then pop the whipped cream and pecans on the thawed cups just before you leave for the shindig. Serve them slightly chilled – they totally pass for a turtle pie! 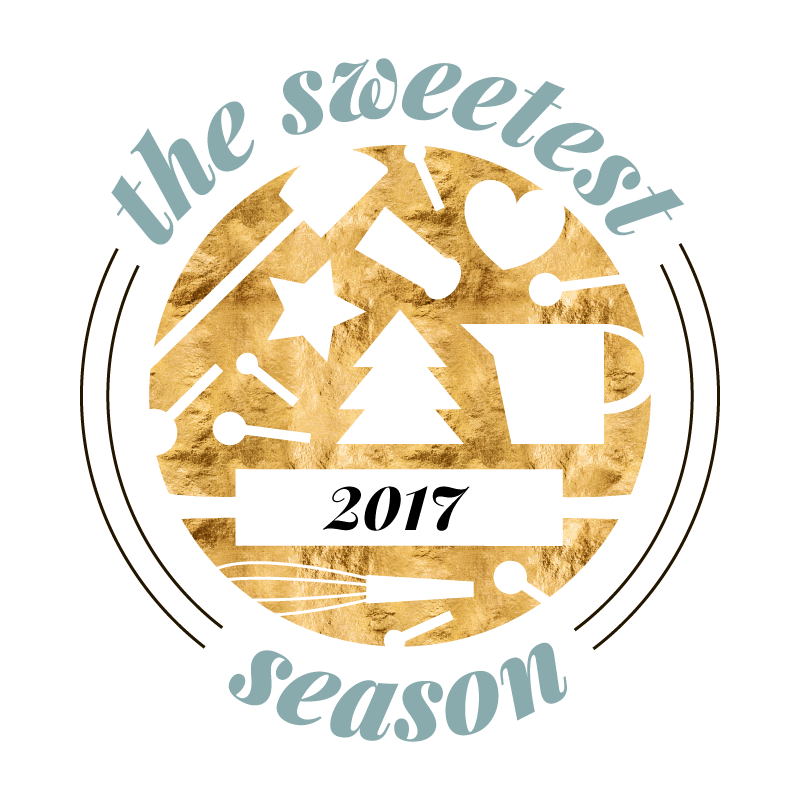 Going all the way back to 2015 for these delicious Sweetest Season cookie recipes! Preheat oven to 350 degrees. Spray cupcake pan(s) with non-stick cooking spray. Set aside. In a stand mixer or with a hand mixer, cream butter and sugars together until pale and fluffy, 3-4 minutes. Add the egg and vanilla, beating until well combined. Add the dry ingredients to the wet ingredients and beat until combined and smooth. Dough will be thick. Refrigerate for 15 minutes. Roll 2 tablespoons of dough into a ball, then press dough in bottoms of prepared cupcake cups, spreading about 1/3-1/2 way up the sides of each and forming a cup shape. Bake for 10-12 minutes. Remove from oven and allow to cool for 5 minutes, then remove to cooling rack. Use the underside of a measuring tablespoon to press the center down if they don't fall enough. Combine brown sugar and butter in small saucepan. Cook over medium heat, stirring constantly until mixture begins to boil. Continue cooking and stirring for about 1 minute. Remove saucepan from heat. Whisk in whipping cream until combined. Cool 15 minutes. 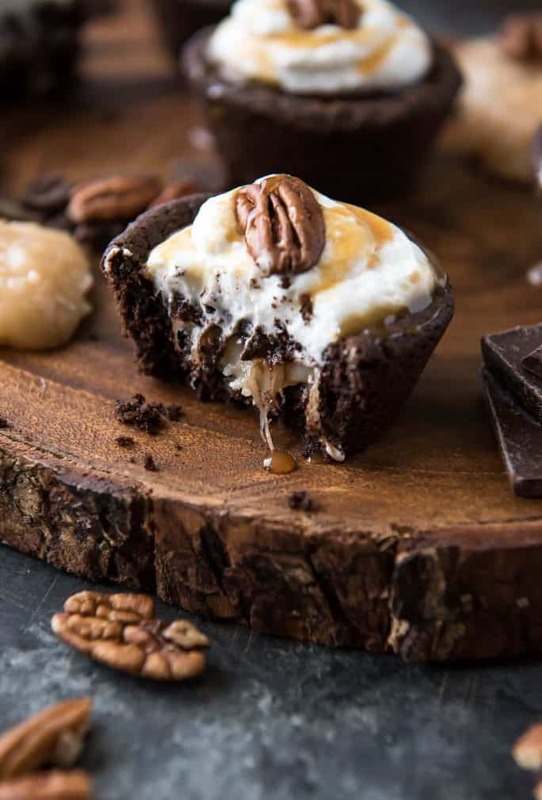 Fill each cooled cookie cup halfway with the cooled caramel. Allow them to set 5 minutes. Heat the cream in a small sauce pan set over medium heat. Bring just to a boil, then pour it over the chopped chocolate. Allow it to sit for 3 or 4 minutes to soften before adding the vanilla, then whisking until smooth. Cool 15-20 minutes. 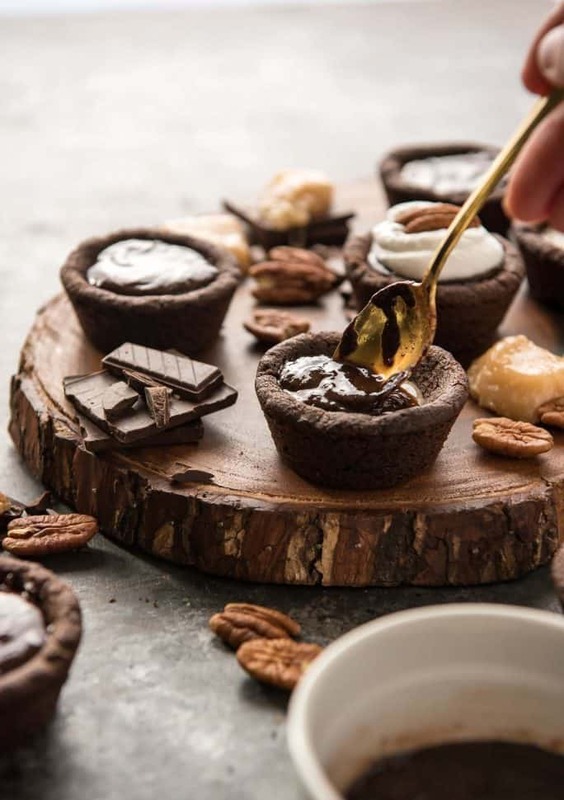 Spoon cooled ganache over the caramel in each cookie cup. Allow to cool 30 minutes. 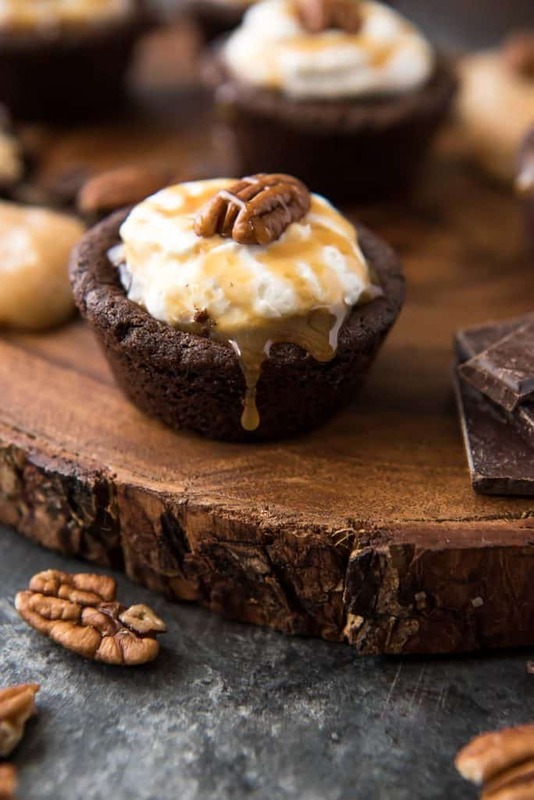 Pipe domes of whipped topping on each cup, garnish with whole toasted pecan halves, then drizzle with caramel and/or ganache as desired. 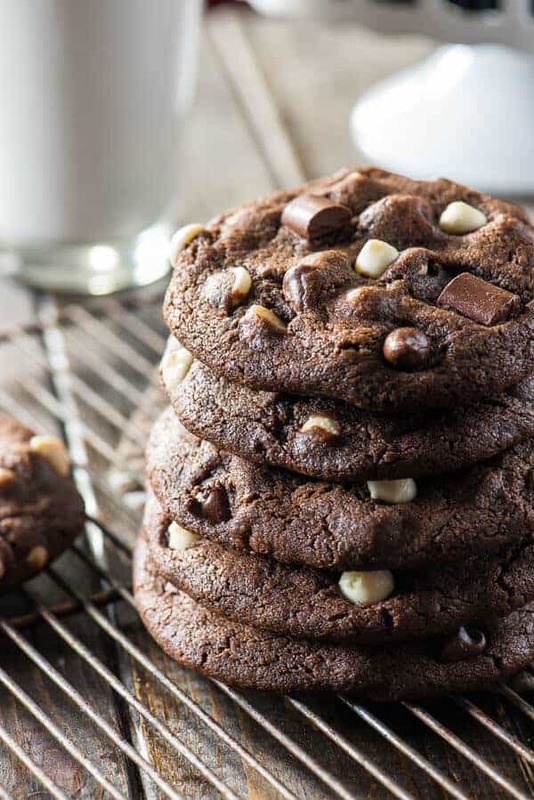 If you loved those Chocolate Turtle Pie Cookie Cups, I bet you’ll enjoy these super chocolate-filled cookies from my collection, too! I definitely need to make these over the holidays! Cookie cups are a huge hit in my house! Pinning for later! Love the photos ! Love the idea ! Pinning ! Thank you so much !